Do you need a pre-owned truck? Head straight to Shriram Automall Physical Bidding Events, our bidding events are like automotive supermarket where you can choose and buy the one you like from a number of options. Every week thousands of people visit our Automalls to buy their desired used truck. 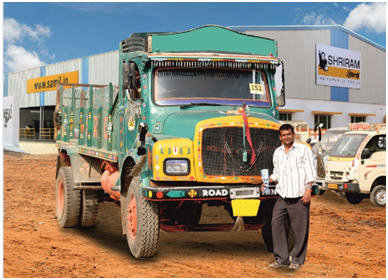 1 CHOICE – As India’s largest service provider for transactions of pre-owned commercial vehicles & equipment, Shriram Automall sells every make & model of trucks including HCVs, MCVs, & LCVs. With 68 well structured Automalls all over the country & a bidding event at almost all days of the year we are sure you will find the pre-owned commercial vehicle of your choice at our next event. 2 SERVICES – At Shriram Automall we do not only deal in pre-owned automotives but also offers a full range of services that make buying or selling your vehicle easy. From financing to refurbishment to documentation to parking and insurance under one roof. This makes Shriram Automall your OneStop destination for all vehicles & equipment requirements. 4 CONFIDENCE – Shriram Automall is in the business for transactions of pre-owned vehicles & equipment since 2011 and in a short span of time the company is trusted by Millions of people around the country. It has bagged 15 national awards for its services & platforms. Our customers show utmost confidence in our bidding platform which offers them transparency & complete peace of mind. Head over to your nearest Shriram Automall now to buy pre-owned vehicle or equipment of your choice.